“Crazy for You,” LaGrange College Theatre’s next production, has been called a “new Gershwin musical comedy” – a modern musical that celebrates the joy of the American theater. This Tony award- winning Broadway smash tells the story of Bobby Child, a wealthy city boy who dreams of being a Broadway star, but is pressured by his domineering mother to be a banker. When she sends him to Deadrock, Nevada, to foreclose on a broken-down theater, he falls madly in love with Polly Baker, the spunky theater owner’s daughter. Kim Barber Knoll, director, said when she read the script by Ken Ludwig (“Lend Me a Tenor” and “Moon Over Buffalo”) and listened to the music, she knew it would be the program’s next musical. “This production has it all: a funny and heartfelt story, incredible Gershwin music and spectacular dance numbers. It’s a wonderful musical comedy for the entire family.”she said. Dr. Toni Anderson, musical director and conductor, said the music is very challenging. She said she can’t wait for the cast to start rehearsals with the orchestra. “It will add a whole new level of storytelling to the show,” she said. "I think the students will love the energy of the orchestration." Knoll said this is the largest production ever attempted by the program. She credits choreographer Tim Fitz-Gerald, the latest new MT faculty member, with infusing great talent and energy into the production. Fitz-Gerald said he’s thrilled with the cast. Landon Bell, a sophomore Musical Theatre major, plays Bobby. He said the best part for him has been the opportunity to grow as a dancer. Leigh Anne Hamlin, a senior Musical Theatre major, said she has had a blast playing Polly. In his first appearance on the Price stage, freshman Colby Bell plays Lank, the owner of Deadrock’s saloon. He said his parents gave him some advice before auditions. Colby said he’s grateful to have the opportunity to work with so many talented people. Knoll noted that all evening curtain times at Price will now be at 7 p.m. Matinees will continue to be at 2:30 p.m. 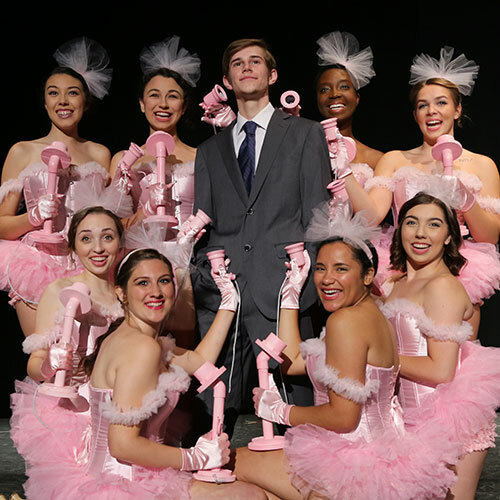 Box office opens Monday for “Crazy for You.” Show runs at 7 p.m. Oct. 24-27 and 2:30 p.m. Oct. 28. Tickets are $15 for adults, $10 for senior citizens (55 and older) and non-LC students and free for LC students faculty and staff. The box office is open weekdays from noon until 4 p.m. Email the box office to make reservations at priceboxoffice@lagrange.edu, or call 706-880-8080. If emailing or calling, please leave name, the performance date/time and number of tickets desired, type of tickets and a call-back number and email address for confirmation. Junior Jazzlyn Kenner became the first LC volleyball player to earn back-to-back USA South Player of the Week awards. Kenner led the Panthers (6-8, 4-3 USA South) to a 2-1 record for the week ending Oct. 7. The Panthers play USA South foes Covenant and Piedmont on Saturday in Demorest. Gracie Amonett and Sydney Dailey scored as the Panthers (4-6-1, 1-3 USA South) edged Wesleyan 2-1 on Tuesday night. The team plays USA South games at Brevard today (Friday) and Covenant on Saturday. The Panthers (1-4, 0-2 USA South) lost 38-14 to Averett last Saturday in Callaway Stadium. Sophomore quarterback Caleb Speir threw his first collegiate touchdown pass for LC. The Panthers play at Greensboro on Saturday in a USA South game. The LaGrange teams opened their 2018-19 season at the Emmanuel College Invitational last Saturday. Freshman Connor Cochran set a new school record in the 1,000-yard freestyle event. The Panther men finished third in the meet. The teams swim in the Sewanee Invitational on Oct. 26-27. The LC golf team plays in the Golfweek Fall Invitational on Sunday through Tuesday at The Raven Course in Miramar, Florida. The Panther cross country teams run in the Berry College Invitational on Saturday in Mount Berry, Florida. Jude McEvoy’s second goal of the game gave the Panthers (8-4, 3-3 USA South) a 2-1 two-overtime win over Berea on Thursday. The Panthers host Pfeiffer on Saturday for Senior Day, then face Maryville on Sunday. 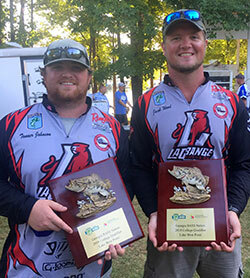 Tanner Johnson and Guy Wegienka of the LaGrange College Bass Fishing Team recently won the Georgia B.A.S.S. Nation state championship at West Point Lake. With their first-place catch weight of 13 pounds, they received the only Carhartt Bassmaster College Series National Championship berth out of more than 55 boats representing public and private universities around the state. Plans are underway for Panther Treks 2019. Dr. Joe Cafaro, retired Professor of History, will be guiding a group of alumni and friends on a trip to Rome, Florence and Venice, Italy. Details of the itinerary are available on the website or by contacting Dr. Cafaro. Dr. John Tures, Professor of Political Science, was interviewed for an article “The Myth Did Not Resist” about President Trump’s finances for the Brazilian magazine Veja. It’s only one week until Homecoming 2018. Visit the homecoming website to learn about all the fun activities planned for the weekend.